The October 2015 issue of Reader’s Digest (India Edition) is out on time and here are our Views and Reviews for the same. The Orange red and white background; red and yellow text and studded with two pencil sketches; the cover page of this issue makes an impact for sure. We often said that this is one of the most important section which a lot of not-so-keen readers avoid reading. Actually, it sets up a bridge between the reader and the editor. In addition to express vision for the issue in short; the editor opens up with his/her responses to some of the reader’s reactions and current happenings. The editorial is short as usual and we got to know that this it the last editorial by Mohan Sivanand. He is retiring this month. He wrote some really good editorials till now and curated some of the not-to-miss issues for the magazine. We would like to say him good buy and wishing him joyous retired life with loved ones. The article by Dr. Mirchandani about managing depression naturally explores some of the cases he attended as a doctor. He explores that how when some techniques are failed convincing the patient, the others got success. After all, patient’s health matters the most. So the treatment which results into positive outcome teaches a lot (even to the readers). Ruskin Bond is a celebrated author. His love for India and Nature is well known. The article is small yet effective. You must read it. Art of living – section brings an article by Paul Robert. It is about how the kids asked their father to take them for vacation. It is interesting to see the child’s vision when they chose a destination to go. Mostly it is based on the information they got about the places from their school books or the words of mouth from their friends. Often, my friend is going (or have visited) there so do I. The choices of the brother and sister about their vacation are different. So the family have to decide the destination. They come up with a solution which many may like. They took each child alone to the place of his/her choice. What do you think about the decision? Do you think it would have been better if the children have visited all the places together with their parents (rather than a single child doing it)? What not to feed your pet – is a good read for pet owners. Top Chef Jr. – is an interesting read. The idea about involving kids into kitchen activities to attract towards the art of cooking is something to think about positively. Being a quality chef is definitely one of the nice profession as well. And yes, it will help kid being aware with healthy food habits as well. It deserve to be a more detailed article. 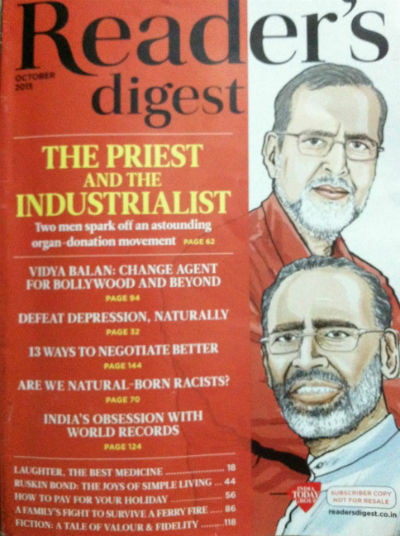 The priest and the industrialist – is a very inspirational article written by Mohan Sivanand. A priest from Kerala – India, father Davis donated one of his kidneys to a total stranger. This act of humanity ignited a movement where an industrialist named Kochouseph Thomas Chittilappilly inspired by father Davis, put in his genuine efforts towards the “organ donation” movement. The article about Racism and prejudices we keep – titled “Are we Natural-Born Raacists?” questions it strongly. It is under “Science” segment! Yes, you read it correct. It makes the article even more important. Actually, it makes the question more important. We recommend you to read it. Ship Down – written by Katherine Laidlaw – falls under “Real Life drama segment. When a family decided to for a vacation via Greek Ferry, they have never thought that they will caught by a trouble and they have to fight to save their lives. But, life is strange and so do the circumstances. The author wrote the real life drama in quite authentic manner. It explores the incidents like in a film or drama, trying to emulate the circumstances, the victims were caught int. The rare photo of burning “Norman Atlantic” adds to the authenticity of the article. Those who love to travel and experienced in expedition can understand these tough situations better than the others. In – RD Interview – section, Harbeen Arora interviews Bollywood actress Vidya Balan. Her abilities as an actress and the awards she bagged are not the only thing she is considered for the interview. On the contrary her commitment towards social work made her the guest this time. Her interview is interesting read. The are is not talking hypothetically. It explores the real problems the real people are facing. You need guts to read and write such important stuff. There are many punch lines in the article. Am I losing my mind – article is focused on Dementia. It talks about eight curable conditions which people often think of incurable. If you like inspirational read – a small article – The Man Next To Me – is for you. Book Bonus – segment brings an emotional tale. Do you know that there is a “gum wall” outside a theatre in USA? Visit – see the world differently segment of this issue. The issue is studded with some nice articles which are definitely worth reading. A balanced issue focused on medical worth and real life aspects. It is worth its price (not only money but also the time you spend to read it).